Raya Lake is located near to the Karang Anyar village in Muara Rupit, 80 km from Lubuk Linggau, it can be reached either by bus or private vehicle for about 90 minutes from Lubuk Linggau through Sumatra highway. The extent of approximately 100 hectares surrounded by wide shrub and clove plantations, rubber, coconut and bananas that belonging to local people. The lake is about 15 meters, the water is clear and it has beautiful sceneries around the lake that make this place perfect for recreation or picnic. 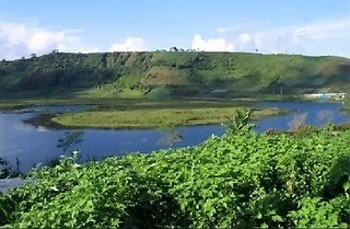 Raya lake has an area of about 100 hectares, with 15 meters deep. The clear waters make this lake as breeding grounds for kinds of fishes like golden yellow Koi fish that is rare species in the world; there is also Arowana fish species, and pufferfish. Another uniqueness that exist around Lake Rayo is there is a tree that bears fruit from the stem down to the ground. The fruit of the tree resembles the mangosteen fruit, but it has little different because it coupled. If it peeled, the fruit content as duku with a distinctive sour taste, the fruit peel is also very thick.